Verbal agreement is normally in person, number and gender, but Hungarian verbs agree with their objects in definiteness instead: a Hungarian verb appears in the objective conjugation when it governs a definite object. 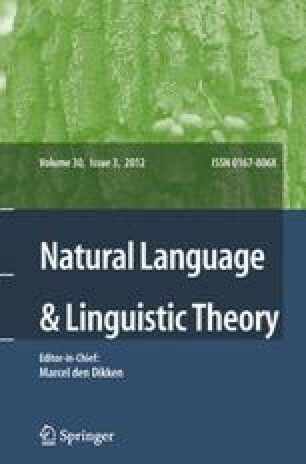 The sensitivity of the objective conjugation suffixes to the definiteness of the object has been attributed to the supposition that they function as incorporated object pronouns (Szamosi 1974; den Dikken 2006), but we argue instead that they are agreement markers registering the object’s formal, not semantic, definiteness. Evidence comes from anaphoric binding, null anaphora (pro-drop), extraction islands, and the insensitivity of the objective conjugation to any of the factors known to condition the use of affixal and clitic pronominals. We propose that the objective conjugation is triggered by a formal definiteness feature and offer a grammar that determines, for a given complement of a verb, whether it triggers the objective conjugation on the verb. Although the objective conjugation suffixes are not pronominal, they are thought to derive historically from incorporated pronouns (Hajdú 1972), and we suggest that while referentiality and ϕ-features were largely lost, an association with topicality led to a formal condition of object definiteness. The result is an agreement marker that lacks ϕ-features. Thanks to Mark Baker, Ferenc Havas, Marcel den Dikken and three anonymous reviewers for extremely useful comments on earlier drafts, to Réka Morris, Éva Kardos and Péter Földiák for Hungarian judgments, to Fabio del Prete for judgments on Italian, to Chiyo Nishida for help with Spanish, and to Irina Nikolaeva, Anikó Lipták, Omer Preminger, Valéria Molnár, Marit Julien, and Lars Olof-Delsing for discussion.